For the structural steel work design transferred force by the joint is known and riveted joint is designed for this force. d = Nominal Dia. of the rivet expressed in cm. t = Plate thickness in cm. By Unwin’s formula, the diameter of the rivet is determined and rounded to the nearest size of the rivet. 2. In order to find out the rivet value (R) the adopted rivet, allowable bearing stress and shearing stress should be considered. 3. Calculate the required number of rivets to oppose the force of the member by dividing the total force to be opposed by the rivet value. 4. 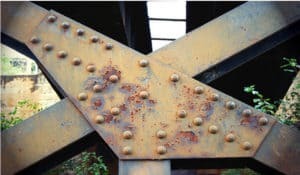 The rivets are commonly arranged in the diamond pattern and the width of the member is calculated by considering tearing failure of the plate weakened by only one rivet hole.